How do I use the Route Progress View? Another function available in the Vehicle Location Map is a view showing the progress of a vehicle on its current route. 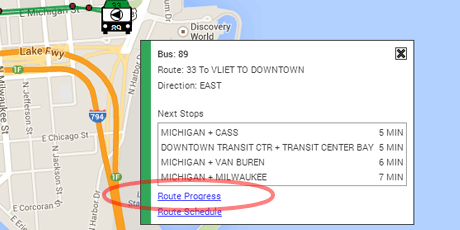 To see this route progress view, click on a vehicle icon on the map and select "Route Progress" from the information box as shown to the right. This will open up the street view shown below. The route progress view shows the vehicle you selected from the main map and all of the other vehicles currently running on the same route variation (shown as the title of the window), with the direction of travel shown by the arrow at the end of the roadway. The stops for the route are displayed as red signs on the roadway. When you move your mouse over a sign, the stop name will be displayed above the sign. When a route has vehicles going to different destinations, a list will appear showing these other route variations and allow you to choose to view one of them. The Route Progress View allows you to set an alarm to let you know when a vehicle arrives at a specified location. To set an arrival alarm for a particular stop, you can either drag the bell from its waiting to the roadway or click on the roadway. When a vehicle reaches that location, a pop-up alert is issued to inform you that the vehicle has arrived. If you are going to use the alarm function to let you know when to go catch a vehicle, make sure you allow enough time for your travel to the vehicle stop. For example, if it takes you ten minutes to reach your vehicle stop, select a stop on the route which is at least ten minutes ahead of your location. This will allow you time to arrive at the vehicle stop before the vehicle arrives. If you change your mind about where to place the alarm, you can either drag the bell to the new location or click at the new location on the roadway. To turn off the alarm, you can either drag the bell back to the waiting area or just click on the bell or the waiting area. When an alarm is triggered, it will appear like the screen below and will generate a "beep". Make sure your speakers are on so you can hear the beep.